Club Penguin Cheats by Mimo777 Club Penguin Cheats by Mimo777: Jet Pack Guy Send Message! Jet Pack Guy sends G a Club Penguin message! Yeah, G, spill the beans! We want more deets, right? In the beta team game yum yum yuck yuck you cant move at all. Please tell ur viewers. Doesn't he have a real name? hmm this is strange i agree with acter boy 1 dot could ask next! SPILL THE DANG ON BEANS GGERALD THE GADGET GUY! Hmmm looks like everyone wants to know what's up what's going on . I think club penguin is just buying time with all this "whats going on" business. They are wasting our money! Heyy Mimo just dropping by mate.Good to see your blogs still going strong. Do you mean G? If you're reffering to him, its Gary. 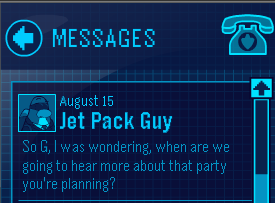 If its Jetpack Guy, it could be George coz' we got a message from herbert on May 17 sayin' "Temper, temper, Jet Pack George." Jet Pack Guy is his real name. Yes Indeed. We should indeed properly know "the tweets". Yeah G spill em' already!